With only ten days of fieldwork, weekends are a social convention that is left for another time, and the alarm is only marginally generous at 8 o’clock. I’d like to add another infobox with a summary view of all objects that I identified as part of the systemic context (cutting short on the topic, for now), not as they were found but as they could have been while in use. Then an extended discussion follows, in a more “traditional” fashion, where the stratigraphic data and the contextual relationships are taken into account. 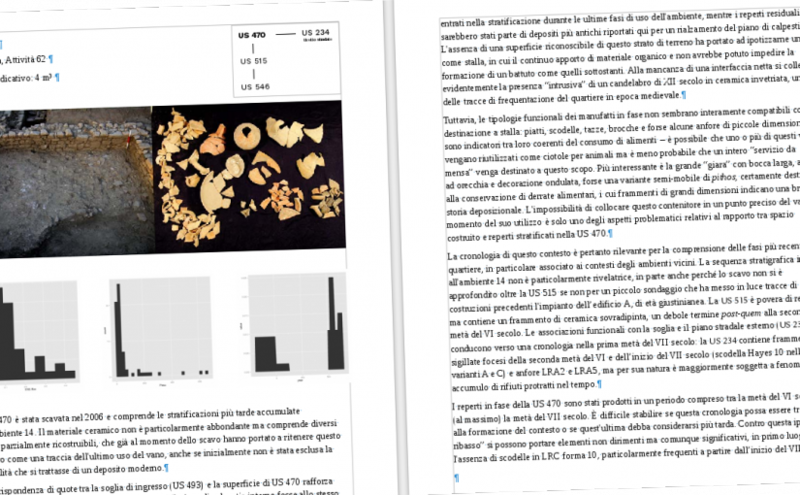 My aim in this part is to bridge the information and the “hard data” from the stratigraphic analysis with a broader view on the life of the household, for example looking at various rooms and our interpretation of their function/use. After the discussion, a catalogue of all finds follows, with drawings/pictures that I will try to keep within the text or very close to their descriptive entries, avoiding separate “plates”, that would betray the principle of primacy of context that I’m following. There was some discussion about whether to include residual finds or not in this catalogue, with Enrico Zanini finally winning the argument thanks to a subtle distinction between residues and residuality. Only the latter should be discussed, leaving an extended description of residual finds to a separate section. I’m quite satisfied with this draft, at least on a conceptual level, but it definitely needs more work on a visual level.